Formlabs is pleased to announce the availability of Digital Dentures, the first truly accessible direct 3D printed dental prosthetic that pushes the boundaries of 3D printing in the dental industry by lowering costs and making denture manufacturing more efficient. Tested at length with dental technicians, Denture Base Resin and Denture Teeth Resin enable dental labs and practices to produce fully 3D printed dentures accurately and reliably. Shipping only in the United States. Formlabs Digital Dentures are certified biocompatible in the United States. We’re working with our partners to make these materials available elsewhere. Watch our webinar with Dr. Bradley A. Purcell to walk through the workflow with our dental experts and learn how you can implement digital dentures in your business. Treatments for edentulous patients have come a long way since ancient Italians in the seventh century BC first replaced teeth with partial dentures made out of human or animal teeth. Today, 50 million dentures are produced a year globally, but only 1 percent are produced using digital tools. Modern dentures are made from acrylic resin and other plastics. The time-consuming and labor-intensive analog workflow involves multiple patient visits and production steps. Denture manufacturing is a complex craft with a steep learning curve, and dental labs increasingly struggle to find technicians with the advanced skills and expertise required to produce them. 3D printed digital dentures are a major step toward the overall simplification of the dental laboratory manufacturing process. 3D printed full dentures consist of different parts for the teeth and gingiva, printed separately and unified in post-processing. Low-cost production: Affordable hardware allows labs to expand production without adding substantial overhead. Material costs around $10 per part for a complete denture compared to $50 using traditional denture cards and acrylic. Accurate, consistent, high-quality results: A directly 3D printed prosthetic means fewer steps and less variability—a more consistent workflow for a quality end product every time. With an efficient, scalable workflow, intuitive hardware and software, and a substantial cost advantage over their handcrafted counterparts, digital dentures will drive better patient outcomes, provide more consistent results, and be more inclusive for everyone who needs treatment. Learn more about 3D printing digital dentures on the Form 2. The Formlabs solution digitizes denture manufacturing, while fitting seamlessly into traditional workflows now. Although the manufacturing process to create a digital denture is different from the traditional workflow, the chairside process is very similar. Today’s digital denture workflow begins after the laboratory pours and articulates the wax-rim and final model. A technician digitizes the model and wax-rim with a desktop 3D scanner, then designs the denture digitally and 3D prints a try-in or the final denture. Watch our video for an introduction to the workflow for Formlabs Digital Dentures. Download our application guide (PDF) for best practices, design guidelines, and the detailed workflow from start to finish. Description Use Denture Base Resin to 3D print biocompatible denture bases for long-term use in the mouth. Use Denture Teeth Resin to 3D print biocompatible teeth for long-term use in the mouth. 3D printing has promised to change the way things are made, and 3D printed dentures are one of the first truly economical ways in which people outside of fabrication industries will come to use and interact with 3D printed parts on a day to day basis. Completely digital 3D printed prosthetics are the future of the dental industry. As digital workflows gain foothold clinically, digital scanning, design, and manufacturing will streamline the entire workflow, reducing the number of appointments and lead time from the first patient visit to the finished denture. Digital workflows are already becoming the standard for a number of key dental indications such as surgical guides, clear aligners, crown and bridge models, splints and occlusal guards, or pattern for casting and pressing, and over 10,000 dental professionals are using the Form 2 successfully in the field. With the latest addition to our library of Dental Resins, Formlabs has set out to make digital dentures as easy and cost-effective as possible. 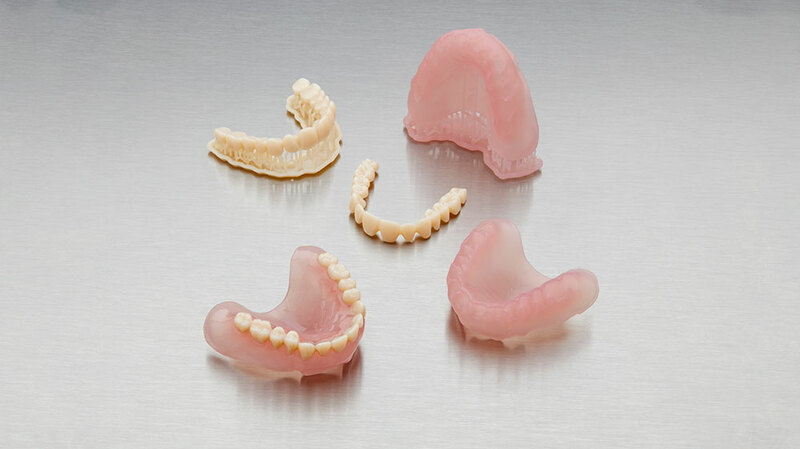 Order Denture Base Resin and Denture Teeth Resin now to start printing full dentures. Curious to hear more? Watch our webinar with Dr. Bradley A. Purcell to familiarize yourself with the workflow and learn why digital dentures make sense for your business.